It was one of the tallest and one of the most dramatic public sculptures ever erected in Britain when it was unveiled to fanfare in 2005. The 2million B Of The Bang sculpture, an ambitious commemoration to mark the 2002 Commonwealth Games in Manchester, was described as a 'magnificent artistic statement' which was meant to symbolise a bold new beginning for the city. However, in spite of its grand launch, there was nothing magnificent about the iconic sculpture's end. The core of the controversial B Of The Bang sculpture has been melted down for scrap metal - raising 17,000 for the city’s taxpayers. B Of The Bang was unveiled in 2005 - two years later than its schedule launch - in the shadow of what is now Manchester City’s stadium. It was named after a quote from former Olympic sprint champion Linford Christie and meant to symbolise the burst of energy as an athlete shoots out of the blocks. However, the 184ft structure was eventually taken down in 2009 after a series of spikes fell off. Furious council bosses - who had paid for the sculpture from the public purse - eventually reached an out-of-court settlement with designers Thomas Heatherwick Studio Limited and subcontractors who worked on the sculpture. The deal saw 1.7m refunded. Since then the core has been recycled, with the town hall receiving 17,000 for the metal. Meanwhile the artwork’s 180 spikes have been kept in storage at a secret location for almost three years. It is understood they are being kept in the hope a donor will come forward to pay for the sculpture’s resurrection. However, the possibility of this happening is thought to be unlikely. Manchester council leader Sir Richard Leese has vowed that no more money from the public purse will be spent on the sculpture. A spokesman for Manchester council added: 'Thomas Heatherwick’s B Of The Bang was a magnificent artistic statement and it was regrettable that technical problems undermined that vision. 'As was widely reported in 2008, the council reached an out-of-court settlement for 1.7m with Thomas Heatherwick Studio and three sub-contractors employed by them in respect of these technical issues. 'The sculpture was dismantled in 2009 and the core was recycled, with the council receiving almost 17,000 for the metal. 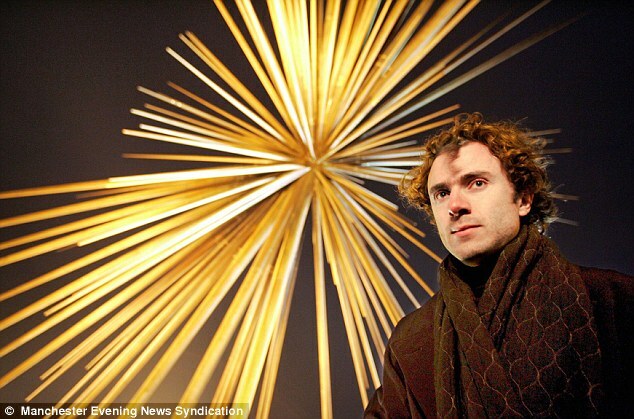 Mr Heatherwick said: 'I am proud of B of the Bang. Although there were structural issues with the project, these could have been resolved. 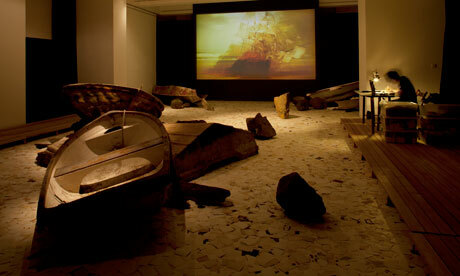 'At the recent opening of an exhibition of my studio's work at London's Victoria and Albert Museum that has a particular highlight on the project, the Academy Award winning Manchester born film director Danny Boyle gave the opening speech and made an impassioned plea for it to be rebuilt. 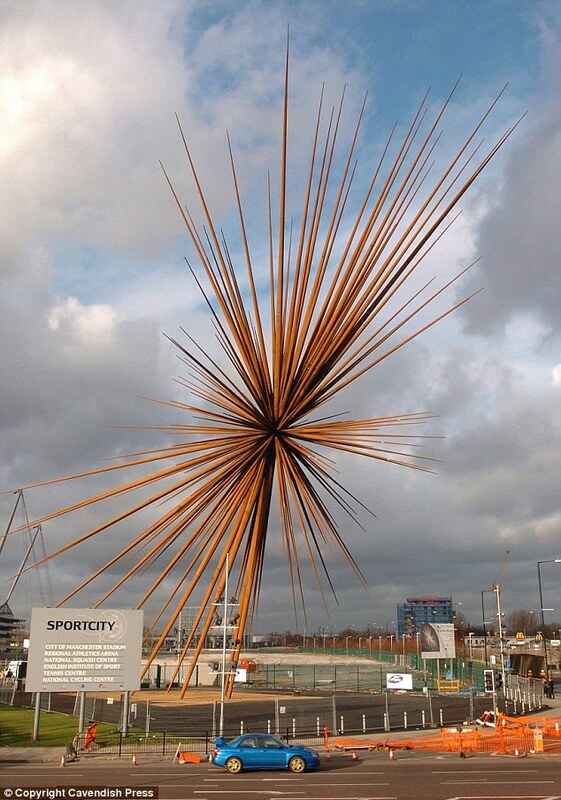 The sculpture was designed by former Manchester Polytechnic student Tom Heatherwick and it was hoped it would become an iconic landmark and provide a lasting reminder of the 2002 Commonwealth Games. Planning permission was granted in January 2003 with a scheduled unveiling date of July that same year. However, later in 2003 it was revealed the cost of the project had spiralled from 750,000 to 1.4million. In August 2004, thieves stole a 30-foot section of the sculpture and in January 2005 a spike fell off days before it was due to be unveiled. 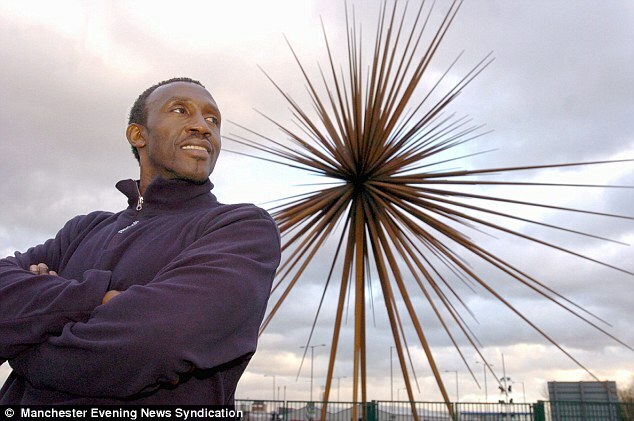 Later that month, Linford Christie attended the glitzy launch event. But by March the sculpture was closed for 10 weeks in a bid to stop its spikes moving and in May firefighters had to cut one free over fears it could fall. A slip road next to the sculpture on Ashton New Road and Alan Turing Way was closed for a year amid safety concerns. In May 2006, engineers began removing nine spikes to test them for signs of stress damage. In October 2007, revealed council chiefs were to sue the makers for 2m. In November 2008, an out-of-court settlement was reached which saw 1.7m handed over to the council by the architects. Eventually, in February 2009, work began to take B of the Bang down and in August of that year the final spike was removed. Proof we don`t live in a proper democracy when taxpayers money can be wasted on vanities like this? ........ and made an impassioned plea for it to be rebuilt. +++++++++++ The nerve of these people. The tax payer is supposed to just reach in their pockets and pull out another few £Million to put another piece of scrap on the sidewalk. What you have to realize is that while self indulgent councillors were splashing obscene amounts of tax funds on this sort of garbage bailiffs were knocking on the doors of poor local people who couldn't pay their local taxes. Couldnt they have chopped off the plane/pavement killing spear ends, had the sculpture using short poles, and said it was about discovering the universe in an atom with the hadron collider etc ? A spokesman for Manchester council added: 'Thomas Heatherwicks B Of The Bang was a magnificent artistic statement and it was regrettable that technical problems undermined that vision. ========Thomas heatherwick should have consulted an engineer who could have told him that it would fall apart. This is why civil engineers double check what architects dream up. Most artist are so full of their own 'artistic talent' that they could not accept these simple facts. Most councillors are too stupid to not waste our money. SPEND OUR MONEY AS IF IT WERE YOUR OWN. It was commissioned from a man who had done 3D design at a polytechnique and had a masters in furniture design, -yet the structure was made from metal. No doubt he had the correct political credentials for Manchester to use him and their commissioning team should be sacked for giving the commission to someone who had no background in designing metal structures. Any local blacksmiths in Cheshire would have said that this design was dangerous. Pretentious, money wasting, crap, same goes for the council. This story far exceeds what bankers have done in my view. Well, there is scrap and there is scrap. Ilfracombe is about to have another load of scrap delivered in the form of a Hirst sculpture but at least its being given free of charge by Hirst himself. Just as well because if as a taxpayer was being asked to pay for it, there would be hell to pay! Tucked away on a quiet cul-de-sac in the eastern district of Sai Ying Pun, 2P is the sole art gallery on a dead-end road otherwise populated by apartments, shops and launderettes. 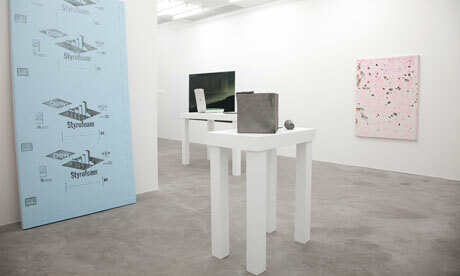 But this modest, well-designed space boasts a programme with considerable whack – it became the first homegrown Hong Kong gallery to be accepted into LISTE at Art Basel this year; it brought with it the considerable local talents of performance artist Morgan Wong and multimedia and installation artists Magdalen Wong, Wun Ting Wendy Tai and Canadian-based Will Kwan. The tiny gallery's openings tend to be raucous social reunions – spilling on to the street outside – for the city's artists, curators and writers. Hong Kong's ever-soaring rents and downtown space limitations have forced numerous gallerists with small spaces in Central to find exhibition rooms further afield. Seeing potential in the burgeoning artistic hub of Chai Wan early on, 10 Chancery Lane set up 10 Chancery Lane Gallery Art Projects in the heart of the cluster of high-rise industrial buildings that line the waterfront in the eastern district. The past two years have seen an influx of design and photography studios as well as a spattering of brave residents, seduced by high ceilings and loft-style living. Chancery Lane's large-scale installation by Vietnamese artist Dinh Q Lê pulled off the considerable feat of luring hundreds of Hong Kong's fickle art-viewing public away from their protective bubble of Central. Ap Lei Chau is a small, densely populated island to the south-west of Hong Kong Island, and its high-rise skyline of industrial buildings makes it an unusual place for a gallery. But Feast makes the most of it, with 5,500 sq ft of white walls, high ceilings and poured concrete floors generously spread over two levels of revamped industrial space. 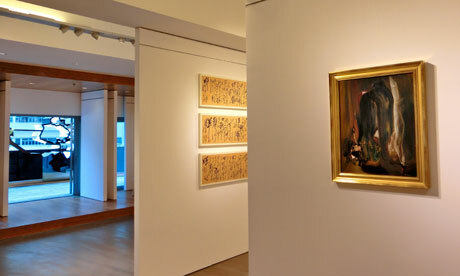 It was opened as a non-profit art space in 2011, with a show that filled the upper main gallery with the abstract oil paintings and calligraphy of world-renowned French-based artist Chu Teh-chun. Other artists of considerable standing have followed – Xie Lei, Marlène Mocquet and Rashaad Newsome have all taken the opportunity to stretch their legs in Feast's bounteous space, a rarity in this hemmed-in city..
Of all the major international galleries that have been flooding into the city, the Gagosian caught on to Hong Kong's cash-rich market potential in 2010, opening a luxuriously large, light-filled space in the Pedder Building in Central shopping district. Since then, aside from much champagne-swilling and elbow-rubbing, there have been substantial solo offerings by blockbuster names such as Richard Prince, Roy Lichtenstein, Zheng Fanzhi and, recently, an Asia-influenced photographic show from Andreas Gursky. While Gagosian's programme has been a little hit and miss, a recent group sculpture exhibition showing the work of John Chamberlain and Cy Twombly hinted at a growing confidence and sophistication. Gallery EXIT was established in 2008, aiming to present artwork that is not afraid to shock – an antidote to the predominantly safe art environment of Hong Kong. Four years later, it's still on message – a recent exhibition by local artist Angela Su consisted of video installations of the artist having 39 lines of text tattooed or "slashed" on to her back. Its centrally located, two-level shopfront building attracts a young, local and well-versed crowd, and the programme is a pretty good indicator of what is happening in East Asian art at ground level. 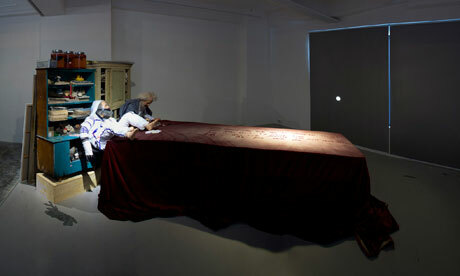 In the relatively young Hong Kong art world, Hanart TZ is positively geriatric. It is tirelessly led by director Johnson Chang, who has championed Chinese contemporary art in Hong Kong since the gallery opened in early 1980s. It recently moved from a modest, book-lined showroom to considerably bigger new digs in the Pedder Building in Central, pitting it against major blue chip international galleries such as Gagosian and Simon Lee. Hanart TZ holds a special place in the hearts of stalwart Hong Kong art lovers, having produced iconic exhibitions in the late 1980s celebrating the work of Ai Weiwei's infamous Stars group of experimental, political artists from China. 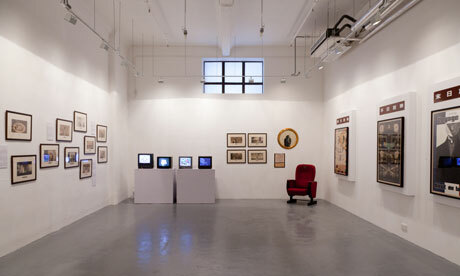 For a long time, Para/Site Art Space was Hong Kong's only non-profit gallery of note. 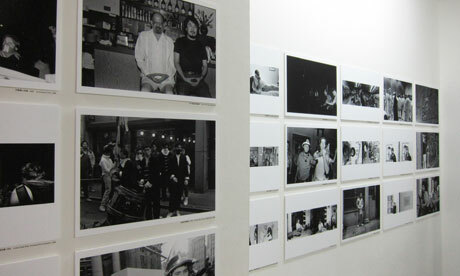 Since its formation in 1996, this small Sheung Wan exhibition space has showed some pretty weighty names. Ai Weiwei has been included in its annual programme more than once, working jointly with performance artist and architect Vito Acconci in 2009, and spearheading its current group exhibition (closes on 12 August) with Frog King Kwok, Tehching Hsieh and Martin Wong, which tracks the four artists' time working and living in New York during the 1980s. Platform China has been established in Beijing since 2005, and opened a multi-function art space in Hong Kong in May this year, bringing a reputation for Chinese contemporary art that encompasses visual art, music, architecture, performance, film and installations. It's a neighbour to 10 Chancery Art Projects in the fast-gentrifying industrial district of Chai Wan. Since it opened in November 2011, Saamlung has had one success after another, recently including the partially destroyed canvases of New York artist Kadar Brock. Painfully cool, Saamlung is the gallery equivalent of that secret bar that every city has, but few know how to get to – hidden among law firms and retail offices on the 26th floor of an otherwise obscure Hong Kong commercial building. Finding it is half the fun. 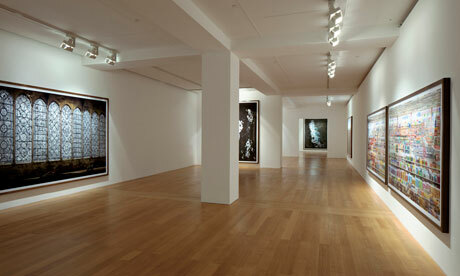 White Cube is the art world giant that everyone loves to hate. 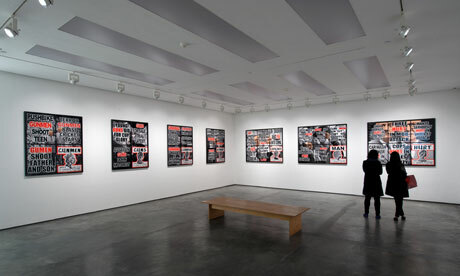 Big and brash, it came bounding into the city in April 2012 with an original Gilbert & George London paintings series. The show was roundly bashed in the press, but its scale couldn't be ignored. The bright, high-ceilinged main exhibition room, flowing into offices and private viewing rooms, could house most of its centrally located rivals many times over. However, it remains to be seen if it has the guts – or interest – to use all that space to challenge and surprise the Hong Kong audience with more than just bankable big names.